Today’s post is sponsored by Ripken Baseball through the Bloggy Moms Network. If you're a baseball fan, chances are, you have heard at least something, about the Ripkens. Usually, when I think of baseball, one of the first names that pops in my head, IS Cal Ripken. I'm sure you have heard of the Baltimore Orioles and if you know them, you definitely know who Cal Ripken, Sr and his 2 sons, Major League Baseball Hall Of Famer, Cal Ripken, Jr and his brother, Bill Ripken. Cal Ripken, Sr always said, "If we take care of all the little things, we'll never have a big thing to worry about." That wisdom carried as much weight at home as it did on the baseball diamond. The fundamentals matter. That's just one of the core philosophies of Ripken Baseball, the youth baseball company started by Major League Baseball Hall of Famer, Cal Ripken, Jr and his brother, Bill Ripken. Cal Ripken, Sr spent 37 years with the Baltimore Orioles organization. First as a catcher then as a manager and a company man. His sons played a combined 33 years in the Majors, with Cal Jr. setting the Major League record with 2,632 consecutive games played and Bill owning a .985 career fielding average. I can't think of a more experienced, more dedicated, more passionate or more committed family, to teach our children the sport. Learning Baseball, The Ripken Way. One of my favorite Ripken Way tips: Celebrate The Individual. No two players are identical. I think this is very important to remember not just for baseball, but for any sport and life in general. In baseball, players differ in size, strength, speed, quickness, and level of understanding. Young people are more apt to learn if they have flexibility and freedom. I find this to be true, every single day, for all of my kids and they are always so anxious to experiment and learn and try new things. If we incorporate this with things such as, baseball, which is built on core fundamentals, our kids will be able to find their own style, their own way, becoming their own individual. As with everything we try to teach our children, parents, coaches and teachers should research and understand as much as we can about it, so we can better adapt the fundamental teachings to each young player's existing talents and comfort zone. Ripken baseball camps deliver an immersive baseball experience. Campers live and breathe baseball, while trained coaches provide an innovative instructional experience, The Ripken Way. The mission of Ripken Baseball camps is to inspire athletes through remarkable experiences, teach the game's fundamentals while preparing them for life beyond the diamond. This is something I find quite fascinating. Using baseball as a way to help teach our children the importance of integrity, respect, perseverance and watching them become passionate about something they love and not quitting while refining their skills. Besides being decked out in the latest, Under Armour gear, campers will learn detailed and technical aspects of baseball while enhancing their overall knowledge. Campers will select 2 different defensive positions to focus on and will spend time each day developing their skills in those positions. (Positions include: catching, pitching, infield, and outfield.) All players will also focus on hitting, base running, and other team fundamentals, In addition, Ripken Baseball also offers a rookie camp program for 7 and 8 year old campers! Ripken Baseball certified instructors, (including former Major League players, current and former collegiate baseball players, high school/college coaches, and Ripken Full Time Operations Staff) are trained in the 'Ripken Way' philosophy of teaching. The camper to instructor ratio will be approximately 8:1. You can check here for a listing of locations and dates for Ripken Baseball Camp! Can't make it to Ripken Baseball Camp? Ripken Baseball offers a "Virtual Academy" complete with instructional videos! I grew up around baseball and a few other sports, so, it's always been a huge part of my life and my childhood. I still have shoe boxes and binders, filled with complete sets of Topps, Donruss, and Fleer baseball cards. (I invested a fortune in my Darryl Strawberry collection. I wish I would have invested some in a couple of other players!!) Naturally, baseball, soccer, ice hockey, boxing, and street hockey are a big part of my children's lives and we spend a lot of time going to games. Our oldest daughter played basketball and soccer as a kid and now, our oldest son plays baseball, soccer and street hockey. I hope to have our younger 2 involved with baseball as well as other sports, as they get a bit older. Street hockey season started this week, so, we are getting back into the strict schedules, practice, practice, practice! Hockey days are extra hectic, since we have to fit in an extra 2 to 2 and a half hours into our already super busy day, Since I shared a tip from, Ripken Baseball, I thought I'd share my own sports tips too! I'm one of those "cook from scratch as much as I can" kinda moms and depending on the meal, this takes a huge chunk out of my evening. 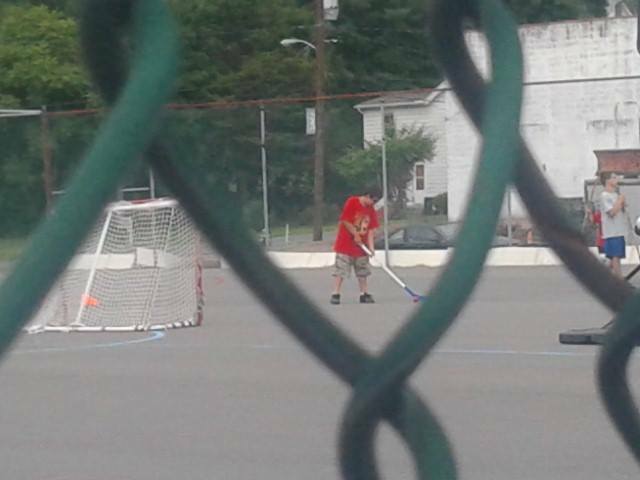 Street hockey just happens to be close to the same time that I would be cooking and cleaning up. I feel guilty just saying, "Grab some cereal" or "Make a sandwich!" (even though, this happens from time to time. ), so, I started coming up with quick and simple and still healthy, quick meals. I asked the kids for input since they are the ones eating it and we came up with quite a few ideas. My kids favorite is "diner night". "Diner night" is pretty much just that, however, we don't visit a diner. We do it right from home. They love this because I'll even rush around and take their orders after the review our short menu and I prepare it, deliver their diner specials in baskets and even go as far as to give them fake receipts with those infamous mints that those lucky waitresses get to keep in their pockets! The menu is simple, usually a variety of sandwiches and their choice of bread, toasted or untoasted, a couple of sides and a piece of fruit. (I realized after having 4 kids that the more fun you make meals and the more your kids are involved, they will willingly eat healthy foods. Even the picky ones! 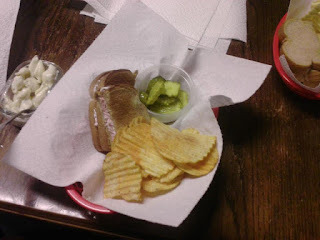 The top choice is a ham salad sandwich on toast, a side of pasta salad, some sort of chips or pretzels and a banana, yogurt, apple slices or an orange. This fills them up and gives the fuel needed for the rest of the evening. Throw some chicken and cheddar cheese in a tortilla and place in a George Foreman grill and voila! Quesadillas! Serve with a piece of fruit and some salsa or any other veggies your kids like and you're set! Quesadillas only take a couple of minutes to warm up and you can add or hide, any kind of veggies inside all of that gooey cheese. English Muffin pizzas are another sports night favorite and the kids can help with these too. You can set up a little pizza topping bar and place dishes of cheese, veggies, pepperoni, pizza sauce, the choice is yours! Have the kids make their pizzas and just heat them up. Of course, always be supportive and cheer for your child(ren) and their teammates. Volunteer to bring healthy snacks and drinks for the team and coaches or even to be a team parent! Coaches and assistant coaches are volunteering their time to help teach our children how to play the sport and a simple, "Thank you!" goes a long way. Ok and onto the GIVEAWAY!! You can enter to win this awesome Baseball The Ripken Way bundle. This bundle includes 3 DVD's and a CD rom. Perfect for parents and coaches!